It is inevitable for growing ecommerce businesses who are looking for a platform to look at Magento 2 and BigCommerce. 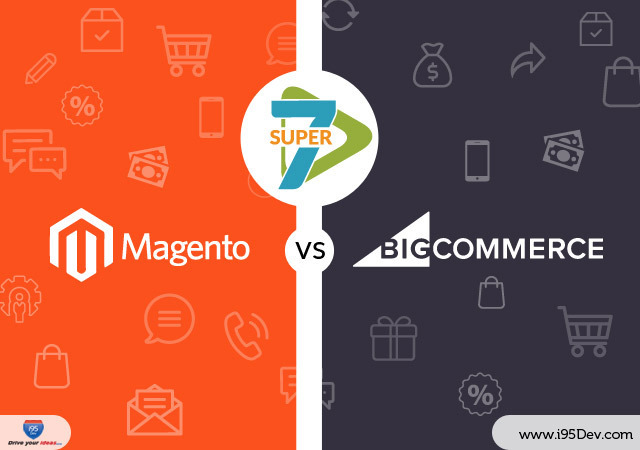 In this part of our Super 7 series, we will take a look at the 7 points that help you choose between the Magento and BigCommerce. The standard yardstick to measure should be the ecommerce platform alignment with your long-term goals, easing your business and helping in growth. All the comparative factors in Super 7 are based on these objectives. The band gap between Magento and BigCommerce is huge. Magento was established with the sole purpose of making ecommerce optimized and that shows up in its popularity. According to a report by Datanyze Magento holds the 4th position compared to the 12th position held by BigCommerce. Even a current trend search between Magento 2 and BigCommerce shows a huge disparity between both these platforms. Apart from this there are a total of 15,686 sites of the coveted Alexa Top 1M which are a part of Magento compared to 1457 of BigCommerce. This can easily help you gauge that Magento 2 beats BigCommerce by a huge margin. This is solely due to the fact of Magento 2 being an open source platform and having a robust online community to help your business anytime. This translates into strong agency network that can take up improvement projects and help you grow. This gives you complete freedom over your ecommerce site unlike BigCommerce, which is proprietary. This is an important aspect, which decides your brand and business going down the line. The difference between Magento 2 and BigCommerce lies in this factor. Magento 2 is self-hosted and BigCommerce is hosted. There are some great options for specialized Magento hosting like Nexcess. The ownership of data, which is a very crucial aspect of ecommerce, lies with you in this case. You as a business must control your customer information without any third party intervention and obligations. BigCommerce, on the other hand, takes care of your hosting. Choosing BigCommerce takes care of your hosting requirements in a packaged deal. But the major drawback of BigCommerce is the ownership of the data. BigCommerce mostly caters to small businesses and you do not have sole ownership of data like your customer data. BigCommerce has a stake in data ownership, and once you go with BigCommerce, you cannot host your store anywhere else. The factor of flexibility is virtually non-existent with BigCommerce. Read our blog for more information on importance of hosting. Design and theme set the tone of your branding and is etched in the mind of your target customers forever. Apart from a visually stunning theme, a responsive site is vital in ecommerce. In this case, both Magento 2 and BigCommerce are on the same footing. Magento 2 offers fully responsive and visually great themes for all screens and resolutions. Magento 2’s open source nature is a big plus. This allows easy customization of the themes suiting your brand messaging. Magento themes are even available with third-party sites and Magento Connect store. BigCommerce provides seven free sleek themes which are responsive. However, customizing the themes provided by BigCommerce is not possible as in Magento 2. This gives limited flexibility even in your branding exercise. The reason for lack of flexibility is BigCommerce being a proprietary entity unlike the open source nature of Magento 2. Marketing and SEO are an important aspect of ecommerce. Both Magento 2 and BigCommerce do a great job at optimizing SEO and boasts potent marketing capabilities. Business like yours which are in a fix would find both Magento 2 and BigCommerce on an equal footing. But there is definitely a difference. For Magento 2 SEO is a native feature since the time of its predecessor Magento 1. Features like product page optimization, layered navigation, category page optimization are pretty advanced in Magento 2. The concept of Analytics is a big leap forward in Magento 2. It allows easy tracking of your customer behavior and concentrating your keywords and marketing campaign accordingly. 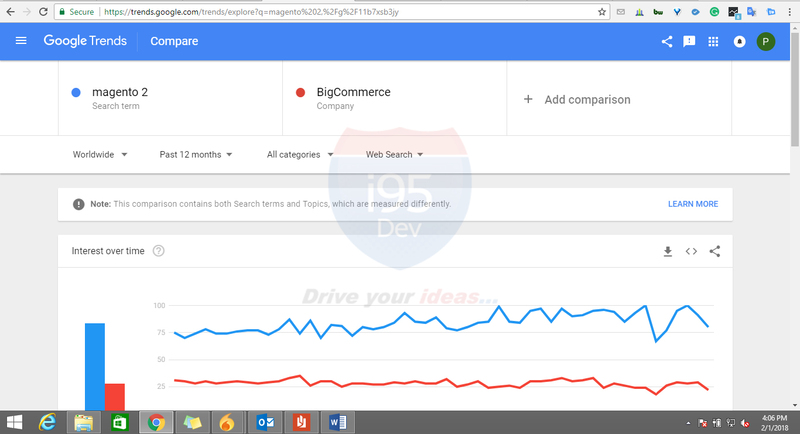 BigCommerce also has great SEO and marketing capabilities. It is very easy to add appropriate keywords to your product and site pages in BigCommerce. There are even robust social promotion tools in BigCommerce where your social networking handles can be connected back to the eStore just like Magento 2. Upon observation, the marketing and SEO capabilities of Magento 2 and BigCommerce are on par. In today’s ecommerce scene, just having limited presence is not an option. Amazon, eBay, Etsy, etc., are known third marketplaces. You must have a strategy in place which includes these marketplaces for increased sales. Magento has a proven track record in integrating third-party marketplaces to the eStore and in the process increasing visibility and sales. For a real-life example of Magento’s marketplace integration capability click here. The same functionality is extended to Magento 2 and there are several third party marketplace extensions suiting the needs and requirements of various business domains. BigCommerce too has the ability to integrate with third-party marketplaces like Amazon and Etsy too. Most integration features of BigCommerce are on par with Magento 2. What good is an ecommerce store when the security issue is not taken care of? While choosing between two ecommerce platform the most critical factor you should be evaluating is security. Magento was developed with the sole purpose of ecommerce. The security features of Magento is top notch and the same functionality extends to Magento 2 too. Magento 2 being an open source platform provides regular security updates and Magento SUPEE patches to its users. Magento 2 users have the freedom to choose the kind of security features they want and can keep adding layers of security according to their choice. You will even receive regular security notifications and updates as and when Magento releases a new security patch. BigCommerce too has a robust security mechanism in this aspect and is on par with Magento 2 in this aspect. BigCommerce is PCA compliant and with the hosting provided by BigCommerce the data responsibility is taken care of by them. In this aspect both Magento 2 and BigCommerce are on an equal footing. The level of support provided by your ecommerce platform can make or break your brand. Magento 2 is ahead of its contemporary BigCommerce by a huge margin in this aspect. Being an open source platform and having a thriving community of Magento developers and agencies all around the world is a huge advantage. You completely have the ability modify your eStore suiting your evolving needs. In addition to a large number of add-ons available, Magento community provides a lot of help needed for ecommerce players like you. BigCommerce, on the other hand, has its own support apparatus in place. It is not an open source community like Magento 2 and that means little flexibility for your evolving ecommerce business. If you are also considering Shopify, make sure to go to our blog on Magento 2 Vs Shopify. i95Dev has worked with various companies spanning different continents since 2000. We are Magento silver certified ecommerce solutions providers. Our clientele span across various domains both B2B and B2C.